Here, after a longer wait than I thought, is part 3 of my Art of War mod, anyone who liked the first 2 is of course going to like this. I added the Borg and the Klingons in this part, these 2 races are miles as the Borg really on a low number of high power ships and the Klingons rush you with spammed BoPs... Anyone who followed my threads on the development will know the Klingons contain a lot of new content, the Borg are equally done but really, who cares about borg models? Lots of small things have been changed in this part (I hope it's a continual improvement) and a few cool things like carriers and ship refits (awesome fun). The old races have been improved with new units to keep them interesting and I have worked on the AI to make it easier bewteen levels but still solid on hard. There were more things I wanted to do, unfortunately I start a new job in London soon so have to move, I'll get back to it when I set up properly. In the mean time have fun! Please note: In order to play the mod, you need to install BOTH Art of War part 1 and Art of War part 2. I have tried to make installation as simple as possible, all of these files are available on A2 files and should be linked to from the download page you got this file from. Just make sure you have a clean install of Star trek armada 2 with the 1.1 patch if needed. I suggest you restart your computer after installing. 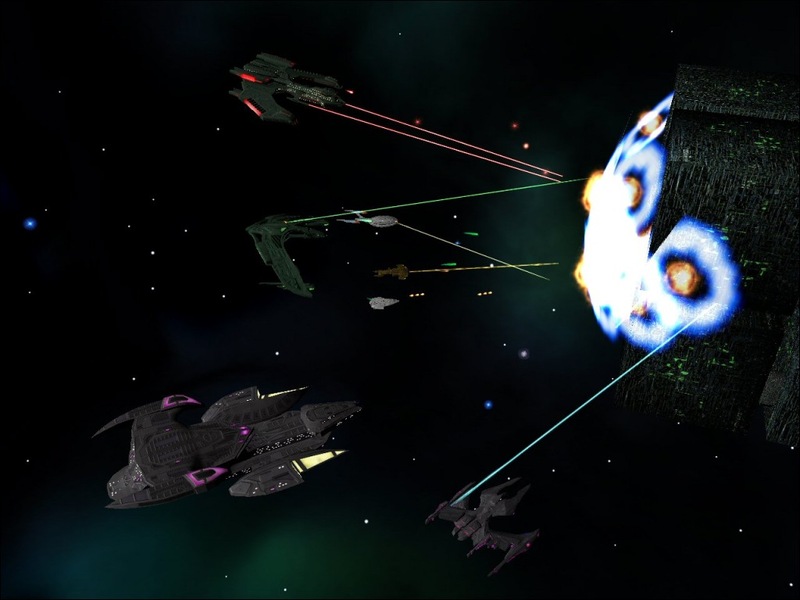 This mod is for Star Trek Armada 2 only! The two races for this part are the Klingons and the Borg. Easily the most powerful race, possibly unbalanced as a result but I did a lot of beta testing. Their ships take a long time to build and cost alot of resource but they are powerhouses, their dreadnoughts can sweep entire outposts aside without backup. 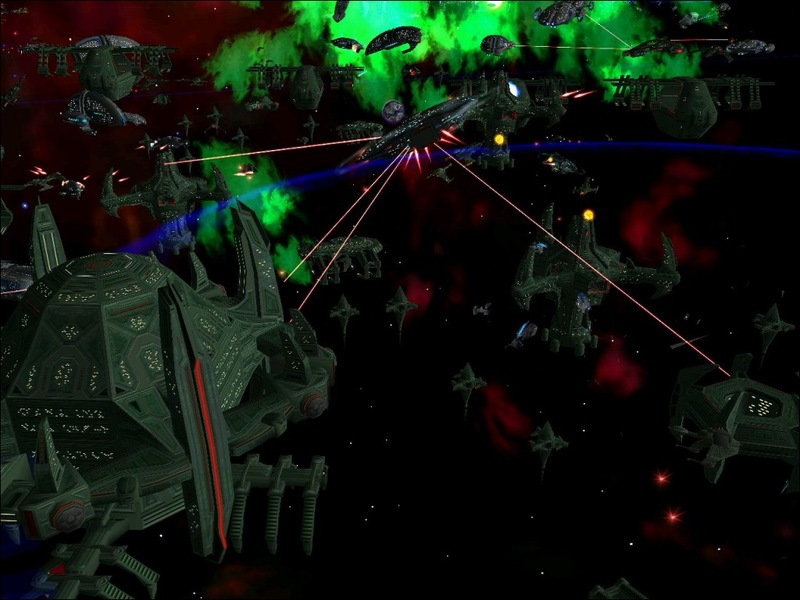 As an AI opponent they are very difficult and I recommend using destroyers to swarm the larger ships. Klingon ships are faster to build and cheaper than average, they have reduced hull and shield strength but their weapons hit harder and fire further. The AI plays them similar to the Dominion and uses waves of the B'rels to overcome you early, midgame is quiet from them but late game sees them using fleet enhancing ships and the powerful battleships/dreadnought en-mass. All shields have been pushed up yet again, eventually I'll get it how I want. The Dominion ships now have Dominion sounds courtesy of STGamer2002 and his excellent Dominion Ultimate mod. The Metathran ships now have their own Crew sounds courtesy of several members of the community (see credits), they also have an individual music score. Newer Physics have been added, they wont be very noticable but ships with wings should swoop and flying bricks will turn slows on the spot. Refits added, several ships for each race have the ability to be upgraded later on, eventually I want 5-6 for each race and that is something I will add as I progress. Refits cost money and are implemented with the 1.2 patch by the Fleetops team. Carriers have been added, several species have 1-2 carrier typr ships that can drop a few fighters or destroyers, these ships work as normal vessels once release and cannot be reintergrated, once the carrier recharges it's special energy it can deploy more. Deploying ships costs money and crew. 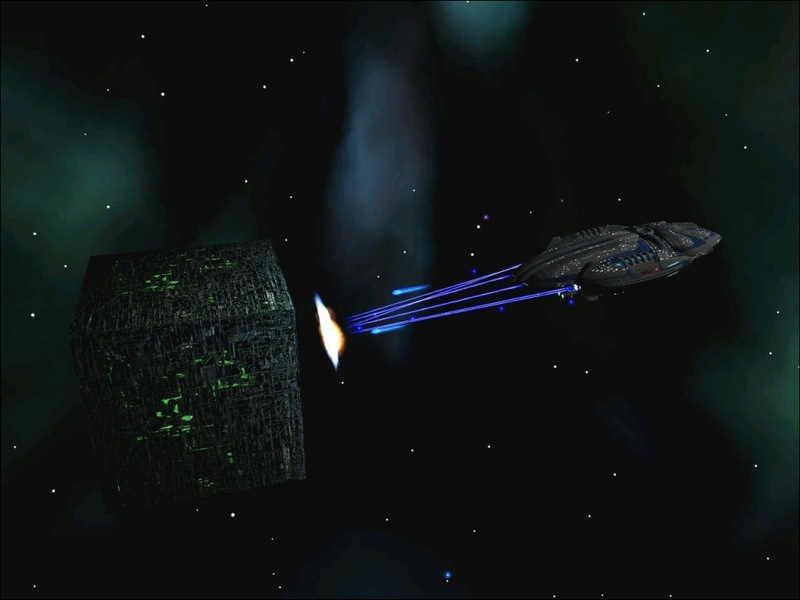 The Cardassians have had their weapons made more canon in both graphics and the hardpoints they fire from. The Metathran supership has a different special, just a recoloured version of the Romulan superships, the old one was buggy. - of their ships to create a super dreadnought. Some new maps added, some updated, remember to play only maps with AOW in their title. A lot of older models have lightmaps added, I will do more in the following parts. lots of other things have been added but most too small to mention, I had planned more but I ran out of time, I got to start a new job soon and wanted this out before I move. - He created the "general hull" on another model, it looked a lot like the K't'inga, so I figured it would fit and took it. - He also did the upper-read platform (top-back of the vessel) for another ship in VR, again, this I liked so used it. - The nacelles, these I took from the Klingon Colony ship in BI:VR. - For the textures, though I edited them and reduced the texture sets for them also. - For the kitbash, the edited textures, and the re-mapping of them. Oh, and the neck which didn't take two minutes (it's just a long circular object). K'Bol'Cha by Pneumonic81. Texture update by Atrahasis. Ngaq'Duj bu Unknown, no credits exist. Mesh and texture by me. Siege Cruiser by Smiley, design by Atolm. Original Model and texture set created by Don "Cleeve" Woligrowski. Refit mesh update by Major A Payne. - Original model and texture set originally created by Scorpion. - Poly reduction/rebuild done by Major A Payne. Original textures reapplied as necessary. Jem'HAdar voices edited from Dominion Ultimate. anything else was most likely done by me and, if so, is free to be re-used, re-released and edited in any fasion so long as credit is given. Special Thanks to Joelteon7/Joel, Major A Payne, Tycoon, STGamer2002 for being good freinds. This project is in no way affiliated, attached, or authorised by Activision, MadDOC Software, or any subsidaries, sub divisions, company members or other such affiliates to the aforementioned companies. They cannot be held liable or responsible for your actions concerning innapropriate usage of the files contained in this mod. Please refrain from contacting any of the above parties with regards to problems arising from any kind of usage of the files contained in the mod, as no support is given. You are responsible for your own usage of this mod, and are dictacted by the standard terms governing its usage. This includes extrenuating circumstances in which 3rd party alteration to the included files may cause problems, or damage to the users system. In this case I, WrathofAchilles, cannot be held liable for such missuse, and will not provide any help or support in these matters. Send any complaints/suggestions/bugs to me at wrathofachilles@hotmail.com I may not answer cause I'll be away but I'll read them eventually. Unless there is a massive error I'll be doing fixes in part 4. @ Fisch: Relax, not everyone checks the comments above his. @ Praxton: If you're using Windows XP this is most likely caused by the included 1.25 patch, Achilles is aware of the problem and attempting an update. Man, the AI is tough! I was the Borg, and I was doing pretty well, I was in the middle of building a cube, and the Feds (on Kill me plenty) send about a 55 ship fleet to my base. After a while, they destroyed my Central Matrix. Then they turned on my Cube Station. They destroyed it with my Cube still being built, with 3 seconds left!! Hello, let me first say great work, this is the greatest mod out there for Armada 2, believe me I tried them all. I have a slight problem, tho it's not serious, but I would like to fix it, if anyone can help me. I don't know about everyone else but after I install the 3 part mod everything works nice except the Federation torpedoes are switched, photons instead of quantums and quantums instead of photons. Still the problem with the crashing game. This mod looks so awesome, I hope that this nasty bug will once be thrown off.